This past Labor Day weekend I went to the best wedding I have ever been to. My own! It was in Memphis TN, and if you have never been you should know that it is considered the birthplace of Rock and Roll. The first Rock and Roll song in history was recorded there (Rocket 88 by Jackie Brentson and the Delta Cats), but its probably best known for it’s most famous resident, Elvis Presley. Since the early 1950’s Memphis has been considered the Mecca for both Rock and Roll and Soul music. The city is lousy with recording studios and it’s safe to say that just about every band has recorded an album there. With a city steeped so deeply in musical history it was important to my wife (I love saying that) and I when planning the event that some of that mojo be reflected in our ceremony (we even had an Elvis impersonator). So when I undertook the creation of our wedding paraphernalia I made sure to use music as the main theme. We decided to call it Lovefest13 and it became a comprehensive creative project that everyone enjoyed in the end. Save The Date – For starters I designed a Save the Date card to look like a concert ticket. Not just any ticket though. I started with a scan of the ticket from the first concert my wife an I attended that brought us together. 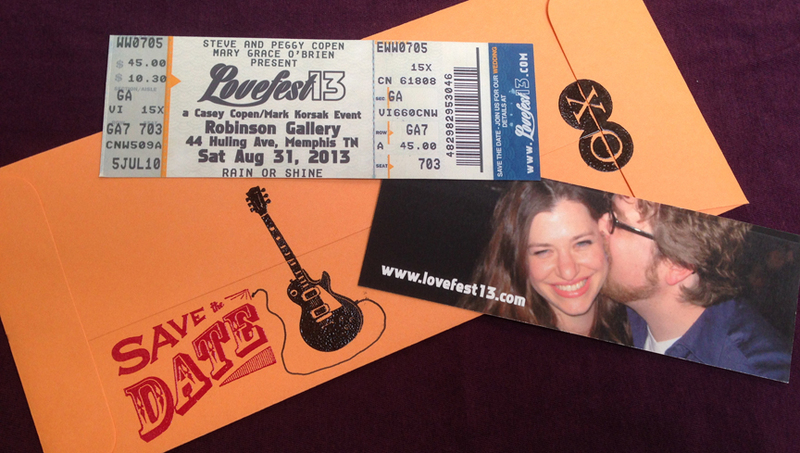 We also decided to name our wedding event “Lovefest13”, the idea being to give guests a concert festival-like experience. This ticket based Save the Date was a perfect set up. I designed a logo to go along with it that could be used on anything important. We went to a local craft store for the envelopes and embossing stamps and spent a Saturday in front of the TV putting it all together. Thankfully a friend of mine kept the original ticket so I could make the scan. Invitation – Next up was the invitation. My wife and I wanted to do something unique, so rather than a traditional embossed invitation we had an audio cd produced. We had a lot of fun coming up with a music mix and a fictitious band name. We finally settled on Significant Others and our album title was going to be Domestic Bliss. I put the playlist together in Garage Band and mixed in some audio clips from famous movies and TV shows with weddings in them. When it came to designing a cover my wife and I knew that we wanted to mimic a studio shot from the 70’s. Earlier in the year we traveled to New Orleans and found outfits at some thrift stores, then visited a friend in Brooklyn a few months later to shoot the pictures. I devised a band logo and laid it all out in Photoshop, then sent it all to the printer/presser. The house in the background is Graceland and the interior is Elvis’s peacock room. The image on the cd itself is the gold record that is on the Voyager spacecraft, “Sounds from Earth”. Not only is it an homage to what could possibly be the most important recording in human history, but Carl Sagan and Ann Druyan met while working on that project and the story of their first encounter was going to fit into our wedding ceremony. Website – Before we could send out the Save the Date or the Invitation we had to put together a website. Something that would be a repository for all the information regarding the event and also serve as a introductory guide to Memphis. It would include the event details and schedule, map, hotel and restaurant recommendations, things to do, RSVP and registry. 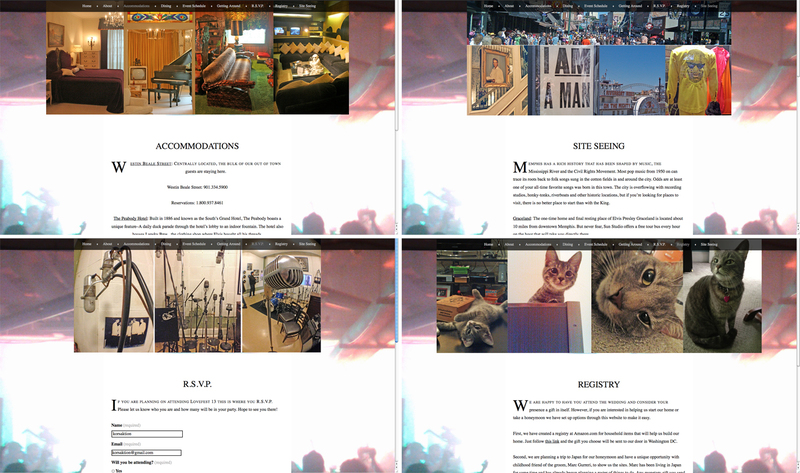 I built it in WordPress and used pictures from my previous visits to Memphis. You can visit the site at lovefest13.com. More designs to come in the next entry of “B Sides”.